OK, so after Mom passed away last summer, we had the gigantic task of cleaning out the house and getting rid of old farm equipment. My brother took the Farmall H, my nephew's cousin bought the Oliver 880, but I'm happy to report that the FIRST tractor I ever drove ( well, tried to steer, standing between Dad's legs ) the oliver 77, has found a home at my son's house. Wonder what all the college professor types in the neighborhood think ? Re: First tractor you drove ? I do not remember what the first tractor that I drove was, my uncle had several. It was either a Massy Fergason or a JD. The first one that I owned was a 53 Ferguson. Not a Massy Ferguson. It was built after Ford renigged on the deal with Ferguson and stole his 3 point lift system. Ferguson then stole the tractor design and they were both building the same tractors. Have to say... Ford 8N. Great little tractor. I think I was 7 when I learned to drive. 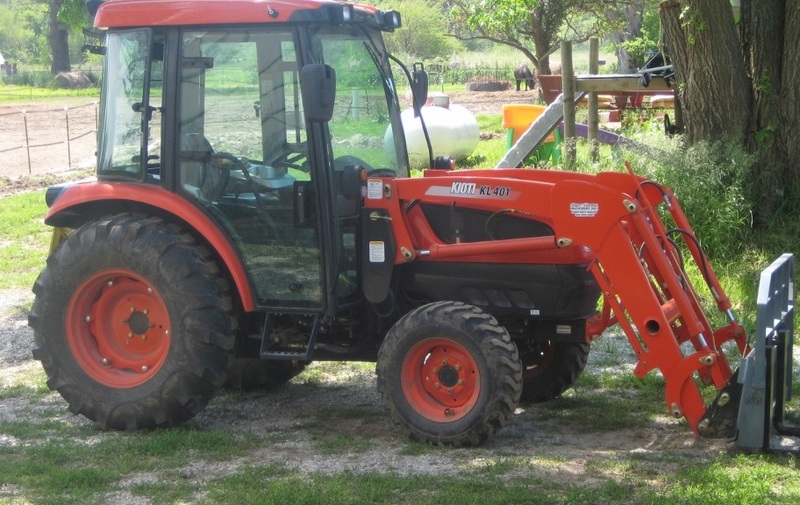 The Kubota I have now with just under twice the power, a bucket and a back hoe is a lot more functional. There is definitely some nostalgia when ever I see an old 8N. My first tractor to drive was an Allis Chambers C, we also had a G which I liked a lot better. Now I have 3 tractors smallest one is a 255 British Leyland, biggest is a 72 HP Massey Ferguson with big front end loader. Would like to still have the old G.
x2 on the 8N. Wish I still had it. Old farmall international, probably early 50 model or older. I got a 601 and an 805. They look like the 8n,9n but the first was a Massey Ferguson which was my friends. The HP ratings of the new tractors are inflated compared to these models. Most are hydraulic so they have to be de-rated again for that loss. Of course the new ones do have advantages but longevity is not one of them. My very first ride I cannot find a pix of. The very first drive came after some riding and tutoring. Known as "Devil", due to the blasphemy which accompanied starting it - "cor an' begorrah thar be the Devil in ye woman!!" as the crank flicked Dad's arm to the shed roof, "she" owned a petrol/kerosene combination engine with a mean backfire when starting cold, on petrol. The rule was "ye don't drive 'till ye can crank her", despite many pleadings of a young keen lad. I was maybe a shade the other side of 11 before I could get her to fire without wrecking my shoulder for a few days. Our only tractor at that time it was a huge step up in Life, literally. Being a high clearance type for the sugarcane, and carrying an array of scarifiers mounted between the front and rear wheels, I couldn't mount it as intended so I used to climb up from the back of the axle over the drawbar. Dismounting was stepping onto the rear wheel and leaping off... a height from the ground as a kid. Sorely tempted to restore more "classics" I resist knowing the body is well past those endeavours. .. aircon cab Michael..??.. Who'da thought! I missed maybe three generations of tractors but I am happy my farm hack has power steering. Next buy is a Bobcat so I can eliminate the steering wheel alltogether!! First drive would have been a little Leyland in the 70's. Neighbour was a specialist in Leyland, Nuffield, JCB gear, always had tractors he was working on for customers or for sale. His son a few years younger than I could drive and operate most of them at the age of 5 and we would regularly drive around on them. They have certainly come a long way in the last few decades. Currently have a 90hp Same fwa, it has a few years on it but quite comfortable with heater, aircon stereo. How does a 5 year old push in the clutch of a tractor. My skinny 10 year old grand son could not use my riding lawn mower due to the clutch. >.. aircon cab Michael..??.. Who'da thought! I need to get other people to do work and the house doesn't have AC... much easier to get people to mow or do other work when the only AC is in the cab of the tractor... not to mention I now realize how much it helps with the dust. The gravel roads put a lot of dust in the grass and mowing it puts it in the air... no more hacking up dust for the next several days. Stand on it mate, he was about 8 when he did a trip to the UK and a tour of the JCB factory with his father. After the tour they asked his dad if he would like to have a play on some of the new machinery, he declined but asked if the boy could. They were amazed at what he could do with a backhoe and excavator. A couple of mates further up the road used to drive a mini around the paddock at a similar age (5/6yo) they were twins, one used to sit on the floor and operate the pedals and the other the seat and steer. I smoke, heavily, Michael, so more dust after a lifetime of it is no problem. Seriously, I hear you, we went full A/C in the home some years ago now. Old bones need to rest in the cool ambients.. heh. "Stand on it mate, he was about 8 ..."
I was gunna quip "put BOTH feet onit" but thought better of it. Tis just what one does when wanting to be 13 when one is just 5. I was hand-cutting cane at 5.. Dad and his gang/crew musta had some good laughs as the 15'long stalk waltzed me across the drill!! 1952 Farmall Super A. We plowed, disked, dragged, planted trees, dragged logs, mowed, spread manure, Did everything with that thing. Its now enjoying a quite retirement in my brothers garage all restored and prissied up next to his Model T and old gravely collection. Gets to pull little kids around in a wagon every now and then. Also had a '39 Alice Chalmers B, Crank start. hand breaks. sweet little machine. Fordson Dexta - 'cause it was diesel, whereas the only grey Fergusons for sale at that time were petrol-paraffin. A great little worker. Sorely missed.